A star-studded line-up of speakers gathered this week for fierce debate and discussion on the forthcoming changes to legal education and training currently sending shockwaves through law firms, chambers, law schools and more. 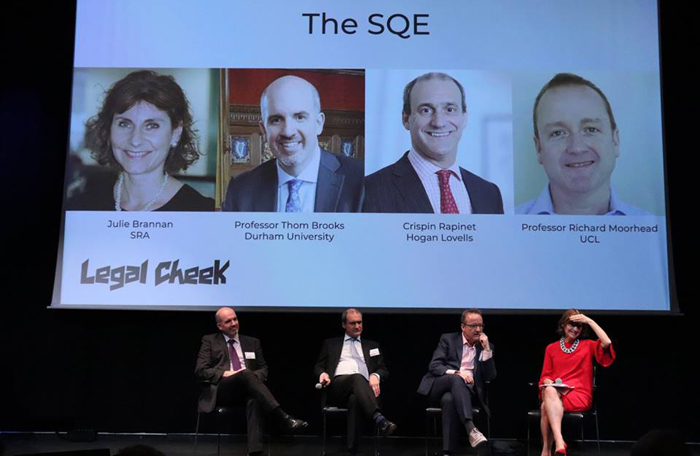 Perhaps the most anticipated part of Legal Cheek‘s inaugural The Future of Legal Education and Training Conference was that on the Solicitors Qualifying Exam (SQE). The exam represents a fundamental shift in how solicitors train and qualify: Julie Brannan, the director of education and training at the Solicitors Regulation Authority (SRA) and the architect of this solicitor super-exam, took the stage to make its case before hundreds of delegates. 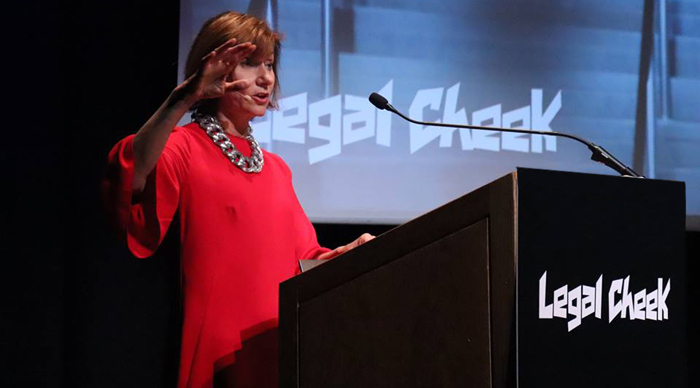 She told a packed-out Hall Two of Kings Place, London, that the SQE will shrink the financial risk that burdens self-funding aspiring solicitors and that handing the centralised exam tender to a single provider will improve transparency, too. Brannan’s TED Talk-style presentation provided a whistle-stop tour of the rationale underpinning the SQE, but she was less forthcoming about operational details (which is what we imagine the roomful of legal education providers and law firm graduate recruiters were keen to hear). It still hasn’t been announced how much it’ll cost, nor which provider has won the exam tender — she even cast doubt on the anticipated 2020 start date. More out-there presentations on the SQE came from the likes of Thom Brooks, the dean of Durham Law School, who compared the exam to Brexit: something nobody asked for and on which details are thin. While Brooks was far from alone is criticising the proposed super-exam, other speakers were more optimistic. Professor Richard Moorhead, the chair of law and professional ethics at UCL, said the SQE gives law schools an opportunity to re-evaluate their approach to clinical legal education (i.e. take it more seriously). Maeve Lavelle, the director of education and community programmes at Neota Logic, flung off her high heels during her ten-minute presentation, during which she said the legal profession is often resistant to change but that the SQE is necessary to improve access to the profession. While legal education experts from the likes of Hogan Lovells, King’s College London and the University of Birmingham continued to thrash out the SQE’s impact, across the foyer barristers gathered to discuss impending changes to legal education and training in their field. The big takeaway there was that barrister training is in need of a shake-up. There’s clearly something fundamentally wrong with a course, the Bar Professional Training Course (BPTC), that currently one quarter of students fail and that is prohibitively expensive for aspiring barristers to enrol and complete. To ease this social mobility problem, the Bar Standards Board (BSB), represented at the day-long conference by director general Dr Vanessa Davies, is pushing ahead with SQE-style changes to barrister training. Expect an important announcement from the BSB about this in the coming weeks. Before the afternoon talks on the SQE and barrister training, the 200 or so delegates enjoyed morning sessions on innovation and the skills the next generation of lawyers need. 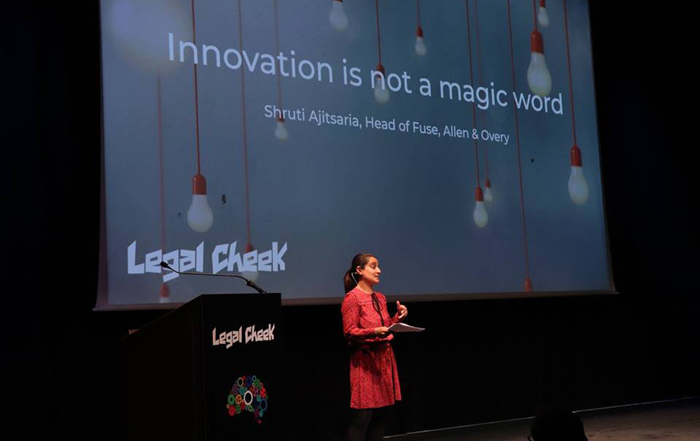 In the first, we heard from Shruti Ajitsaria, head of Fuse at Allen & Overy. Her enlightening presentation balanced optimism about the future impact of technology and innovation alongside an admission that, despite the buzz, the effect on legal services has so far been minimal. David Halliwell, the director of knowledge and innovation delivery at Pinsent Masons, discussed some of the changes that have so far taken place, for example that technology has opened up new legal roles such as legal engineers and legal technologists. As for the impact of innovation on the graduate recruitment market, Isabel Parker, chief legal innovation officer at Freshfields, thinks firms are now seeking students who are cognitively diverse, hungry and gritty, with a start-up mentality. However, the final speaker in the innovation session, Julia Salasky, CEO and founder of CrowdJustice, wasn’t convinced by law firms’ credentials as a forum for nurturing entrepreneurial trainees and young lawyers. Salasky had herself grown frustrated in her former career as a magic circle lawyer because of the lack of creativity she felt she was able to bring to the table. This innovation session flowed nicely into an hour-long interactive discussion on the skills students need to make it as lawyers. 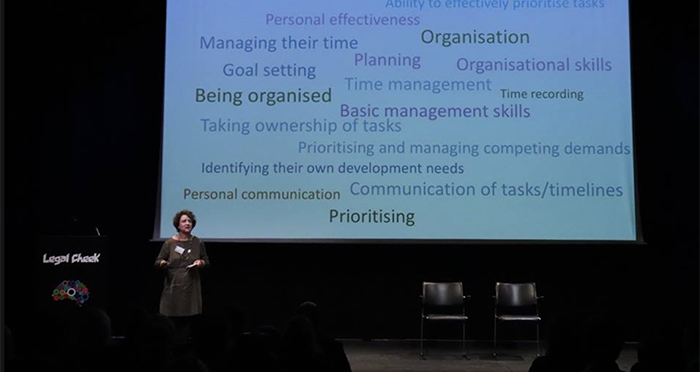 This included a presentation of research from BPP by the law school’s director of strategic design and development, Jo-Anne Pugh, which namechecked skills such as commerciality, written communication and resilience as key. The final session of the day was a fireside chat on education and training in other professions, featuring: Euan Blair, the founder and CEO of WhiteHat, Sam Harper, the former General Counsel of Deliveroo, Samuel Gordon, a research analyst at the Institute of Student Employers, Keily Blair, director of regulatory and commercial disputes at PwC, and Iain Gallagher, the senior manager of emerging talent at Santander. What shone through is other professions’ enthusiasm for apprenticeships. Harper for one explained that there’s a culture at Deliveroo of learning on the job and figuring things out for yourself, while Gallagher said the top bank currently has 200 apprenticeships and will have 500 by the end of the year. Legal Cheek would like to thank all the speakers and delegates that joined us at Wednesday’s The Future of Legal Education and Training Conference — we look forward to seeing you all again next year. What have they been doing this whole time? Did they sit under a tree, meditate and get enlightened? I feel really bad for the single cohort that’ll be forced to undertake it before it’s tossed out and never spoken of again. 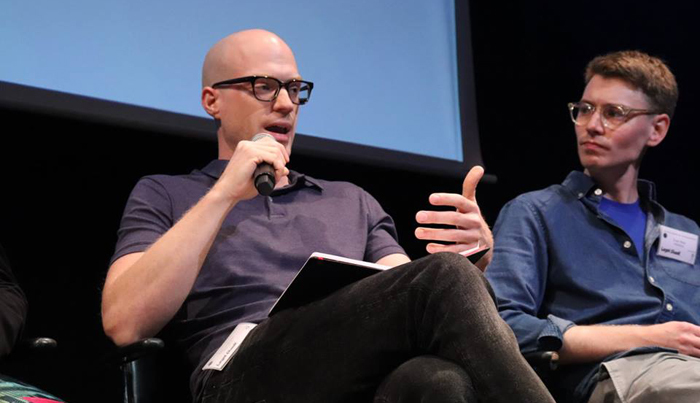 A more diverse range of people talking about areas outside of commercial law and technology, rather than repetition from very similar people talking about very similar topics in 10 minute short bursts. It didn’t need 8 TED talks on reactions to the SQE, of which 5 were from academics. Less white, middle aged, middle class people (even if that is representative of the industry). A room with some light and windows, although the dark cinema style environment made it quite useful for some of the audience to have a power nap when the repetition got too much. The event was a great idea but the general consensus was that most people just walked away from the event frustrated that they had just listened to everyone moan about what others were/weren’t doing. I’d be surprised if anyone felt they learnt anything. The biggest problem is the decline of greek and latin and secondary education level. Without classical disciplines you cannot create a meritocracy or encourage diversity at the grassroots. One quarter of students fail the BPTC…lol? I think you’ll find it’s just one quarter that pass on a first attempt.